How to Bring Efficiency, Cost-Effectiveness & Flexibility into Your Kitchen. 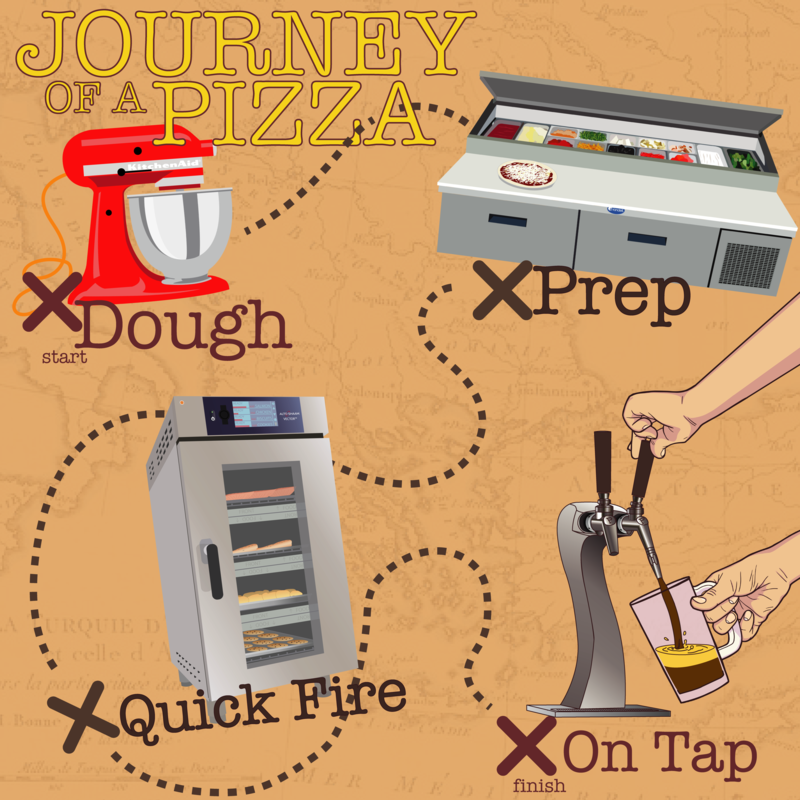 It’s time to embark on the Journey of Pizza with us! There are so many elements that go into the creations that come out of your kitchen, and we’re not just talking about the ingredients. The tools you rely on in helping your operation meet the demands of your customers in producing consistent, quality dishes should also give you the ability to explore creating with more products! Let’s take a look at what we’re talking about. Our first stop is where it all begins. The framework of a pizza. The structure upon which the pie is erected. We’re talking about that beautiful crust. From crispy, thin and crunchy to airy, bubbly dishes straight from the old country, this sets the foundation of your pizza. As much power as the ingredients that go into creating a superior crust control, the tools that help bring your gift to your customers are of equal importance. 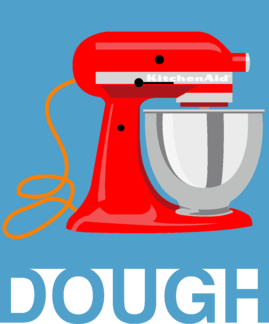 At the forefront of the commercial mixer game is the KitchenAid Commercial Stand Mixer. Known for its iconic, timeless look with the Empire Red-coated stainless steel (more color options available), this bad boy in the kitchen has a massive 8-quart bowl. To put that in perspective, you’re turning out over 11 dozen cookies in one batch! Not to mention the peace of mind it brings you with its powerful 1.3 HP motor and strong bowl-lift design when mixing those heavy ingredients or large batches. In light of all the great features, the most valuable asset the KitchenAid Stand Mixer delivers on is the time it frees up in your kitchen. The truth is, if you’re creating dishes from scratch or have a high-volume operation time is something you don’t have a lot of. 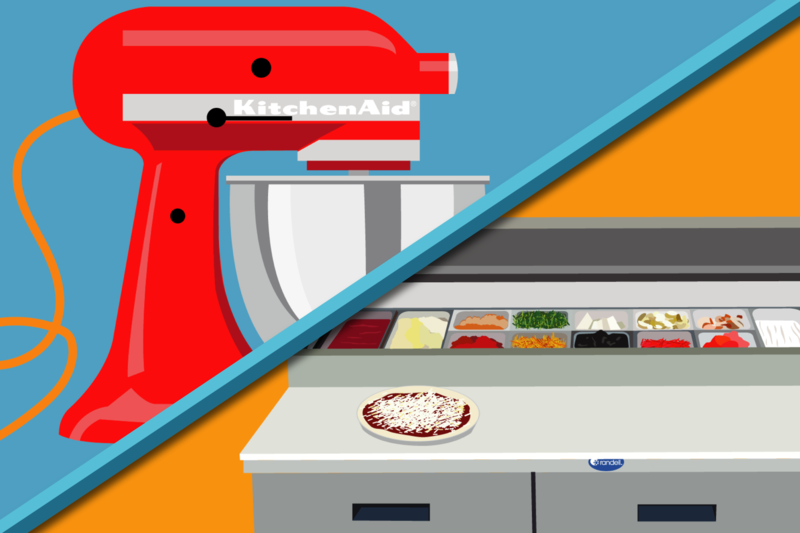 Top-of-the-line KitchenAid products bring efficiency to all aspects of your operation. Pizza restaurants make up over 17% of the restaurant industry as a whole humming to the tune of over $44 billion dollars in revenue in 2017. Feeding a pizza-crazed society that shows no signs of slowing down requires pizza restaurants to be light on their feet and extremely efficient in both preparation and production in the kitchen. Equipping your kitchen with a prep table that allows you to evolve and adapt to your customers’ increasingly refined tastebuds is a game-changer. Knowing what to look for in a prep table can be overwhelming, but with a little reverse engineering you can be on your way to maximizing your profits in no time! Temperature Control - let food safety be the least of your worries. Ease of Operational Use - look not only for ergonomically-driven designs, but the units with the easiest maintenance will make your life much less stressful. Flexibility & Capacity - the customer comes first: having the ability to customize your menu at the drop of a hat and tackle high order volume at the same time should be a priority. 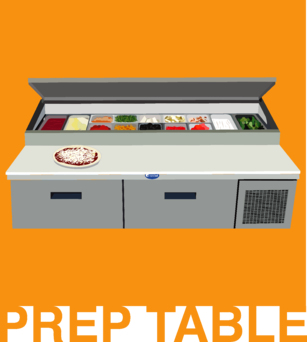 Customization - providing a prep table solution specific to your operation. Thanks for checking out the first half of our Journey of Pizza. Keep up with our E3 blog as we continue on this topic by bringing in the Alto-Shaam Vector and heading to the front of house with America's favorite bar equipment provider, Perlick.